JOHN S. "JACK" O'GRADY was born in Philadelphia PA in 1884 to Henry and Mary O'Grady. The family was living at 4613 Main Street in Philadelphia at the time of the 1900 Census. He had married at the age of 23, but at the time of the 1920 census was disabled and living at his sister Alice's home at 226 Berkley Street. Also residing there was his widowed father, Henry O'Grady, who was then working as a prison guard. 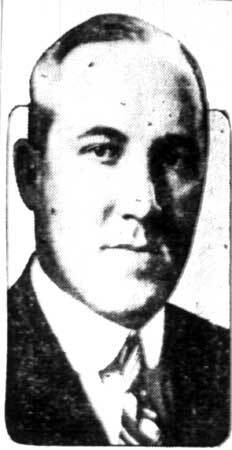 Jack O'Grady was back to work by January of 1920. He was then living with his wife Clara at 707 Lawrence Street and working as a bolter in one of Camden's shipyards. Also living with them at that time was brother-in-law Fred Hopf. In the 1920s and 1930s Jack O'Grady served Camden as a Justice of the Peace and Constable. At the time of the 1930 Census he was still living with wife Clara at 707 Lawrence Street in Camden. He still was working in that capacity as late as February of 1933, when he was elected President of the Camden County Magistrates and Constables Protective Association. By the time the 1940 City Directory was compiled he had passed away. His widow Clara was still living at the Lawrence Street address. O’Grady stated he will present letters from the Bricklayers and Iron­workers Unions urging the reappointment of Wescott. Cocchiaraley is heading a group of South Camden Italians who are also favoring the reappointment of Wescott. Dominic Caccase, 52, of 217 Mickle Street, was ordered held in $500 bail for hearing in Police Court on a non-support charge yesterday. His wife, Grace, charges Caccase failed to provide for her and their five children since December 20, 1931. He was arraigned before Justice or the Peace Albert A. Mungioli, of 314 Stevens Street following his arrest by Constable Jack O'Grady.